Amaç: Septal deviasyonun önemli paranazal yapılara ve sinüs hacimlerine etkisini değerlendirmek. Sonuç: Ostiomeatal kompleks çapı, frontoetmoid reses çapı ve etmoid hücre hacmi deviye tarafta daha küçük bulunduğundan rinolojik cerrahilerde deviye tarafta artmış cerrahi risk olabileceği akılda tutulmalıdır. Development of the nose and paranasal sinuses are interlinked. Development of the sinuses is a slow process which starts at early periods of intrauterine life and continue till sinus pneumatization and bony growth have ceased in early adult life. Knowledge of the embriology is essential for a basic understanding of the anatomical relation of these structures, but it is equally important for the clinician to appreciate the important anatomical changes which continue to take place throughout the developmental process. The congenital or acquired pathology of a maxillofacial structure that causes an obstruction in nasal airflow effects the developmental process . There are studies evaluating maxillofacial development in children with congenital choanal atresia, adenoid hypertrophy and septum deviation [1,2,3]. Since the development of paranasal sinuses continues till the age of 18 research results of adults are more informative. The most common cause of nasal obstruction in adults is nasal septal deviation . Studies search for the relationship between nasal septal deviaton and concha bullosa formation, maxillary sinus and ethmoid sinus volumes in recent literature [5,6,7]. To the best of our knowledge, there is no study in english literature searching for the morphology of frontoethmoid and sphenoethmoid recesses of adults with nasal septum deviation. The aim of this study was to evaluate how nasal septum deviation effect paranasal structures with a broad perspective by means of a retrospective study. This study was performed at the Department of OtolaryngologyHead and Neck Surgery and the Department of Radiology, Kecioren Research and Training Hospital. The study was approved by the Institutional Review Board of the Kecioren Research and Training Hospital. Paranasal computed tomography (CT) images were obtained from the archives of Kecioren Research and Training Hospital and analyzed retrospectively. We identified 133 consecutive patients who had undergone CT scans of the nasal cavities and paranasal sinuses between January 2014 and May 2014. The CT scans had been ordered for evaluation of nasal structures before septoplasty. A total of 133 patients over the age of 18 with nasal septal deviation were included in the study. Exclusion criteria were; previous sinonasal surgeries or sinonasal trauma, nasal polyp or mass lesions of the sinonasal region and acute or chronic inflammatory mucosal diseases that disturbs thevisualization of the anatomical spaces. CT examinations were performed using a sixteen detector-row CT scanner (Toshiba Activion, Tokyo, Japan), in the supin position without contrast material using. The scan parameters are: 120kVp tube voltage, 200 mAs, high resolution, 1 mm contiguous axial slice. CT scanned area was obtained between the roof of the frontal sinus and the base of the maxillar sinus in all patients. A workstation (Aquarius Intuition, Tokyo, Japan) was used for post-process the volumetric CT data sets using multiplanar reformatting (MPR) images and volume rendering reformat images. 1. Deviation angle of nasal septum: The angle between apex of the septal deviation and the line crossing the anterior nasal spine and the crista galli (Figure 1). 2. Recess diameters: The narrowest frontoethmoid recess, ostiomeatal unit and sphenoethmoidal recess diameters were measured on deviated side and the contralateral side, separately. The frontoethmoid recess and ostiomeatal unit diameters were calculated on coronal reconstruction images, while sphenoethmoid recess diameter was calculated on axial reconstruction image (Figure 2). 3. Total nasal cavity volume was calculated with the same software (Figure 3). The nasal cavity is limited superiorly by the cribriform plate of ethmoid bone; inferiorly by the hard palate; laterallyby the lacrimal bone, palatine bone and maxillary bone; medially by the nasal septum. 4. Volume of sinuses: Frontal, maxiller sinuses and ethmoid cell volumes were calculated by semi-automated region of interest segmentation (Toshiba, Tokyo, Japan) on deviated and the contralateral side, separately (Figure 4). This threshold levels were chosen according to air density (less than 0 HU). Sinus volumes were marked using this software manually by readers, on the axial MPR image. Then the measured volume was checked other MPR images, for being sure the exact volume borders. 5. Concha bullosa (CB): Absence or presence of concha bullosa were noted separately on both sides. Volume of CB was measured using semi-automated region of interest segmentation (Figure 5) and also CB were classified according to Bolger et al . Sixty six cases examined by one of the radiologist, sixty seven cases examined by the other. Statistical analyses were carried out with IBM SPSS for Windows version 22.0 statistical software. Continuous variables were presented as mean±standard deviation. Categorical variables were summarized as frequencies and percentages. Distributions of the numeric variables were examined by Kolmogorov-Smirnov test for normality. For numeric variables, differences between the two dependent groups were determined by paired samples t test. Categorical variables were compared by Mc Nemar test. Independent samples t test was used to compare two dependent groups. Welch ANOVA test was used to compare the more than two independent groups according to continuous variables. Relation between continuous variables were determined by Pearson correlation coefficient. Significance value was considered as 0,05. Of the 133 patients included, 49,6% were female (n=66) and 50,4% were male (n=67). Patient age ranged between 20-48 with a mean value of 34,5±13,8. Septal deviation was right sided in 61,7% (n=82) of the patients and left sided in 38,3% (n=51) of the patients. Deviation angles varied between 2,7 and 21,5 degrees with a mean value of 9,7±4,1. Table 1 shows the measurement of all parameters in deviated side and contralateral side. The presence of aerated uncinate process, agger nasi, haller and onodi cells did not variate between deviated side and contralateral side (Table 1). Total volume of nasal cavity was 31,2±8,9 cm3 in deviated side and 32,7±9,6cm3in contralateral side (p=0,087). The mean wide of osteomeatal unit diameter was significantly smaller in deviated side (1,15±0,36 mm) than contralateral side (1,39±0,44 mm) (p<0,001). The mean wide of frontoethmoid recess diameter was significantly smaller in deviated side (1,06±0,34 mm) than contralateral side (1,16±0,36 mm) (p<0,001). 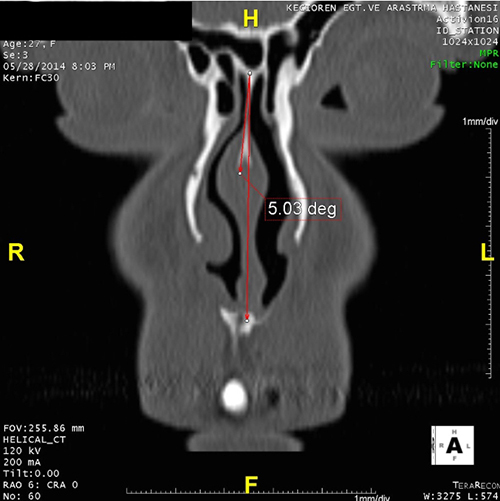 The mean ethmoid sinus volume was significantly smaller in deviated side (13,0±4,0 cm3) than contralateral side (15,0±4,5 cm3) (p<0,001).Wide of sphenoethmoideal recess, maxillary sinus volume, frontal sinus volume were not significantly different between deviated side and contralateral side (p>0,001). There was no significant correlation between the degree of septal deviation and calculated parameters (p>0,001) (Table 2). Concha bullosa (CB) were found in 90 (67%) cases, of which 55 (61%) were bilateral and 35 (39%) were unilateral. 52 (58%) of the concha bullosa were lamellar type, 33 (36%) were bulbous type and 5 (6%) were extensive type (Table 3). 43 (47%) CB were found in the deviation side and 47 (53%) CB were found in non deviation side (p>0,001). The presence of aerated uncinate process, agger nasi, haller and onodi cells did not variate between CB side and contralateral side in unilateral CB cases (Table 4). Ethmoid cell volumes were significantly higher in CB side (5,3±1,8 cm3) than contralateral side (4,5±1,4cm3 ) (p<0,001). Table 4: The correlation between the presence of concha bullosa in deviated side and frontal sinus volume, frontoethmoid recess diameters. The presence of concha bullosa in deviated side did not have a significant effect on the volume of frontal sinus and frontoethmoid recess diameter (Table 5). In our daily clinical practice as an otolaryngologist, we intimately involved with diagnosis and treatment of upper respiratory tract problems. Most of our patients have deviated nasal septum and paranasal sinus pathologies. Additionally, septoplasty and endoscopic sinus surgery are commonly performed procedures. This study was planned to further evaluate the morphologic structure of paranasal sinuses of patients with a septum deviation and to provide a better understanding of the associated and contributing anatomic features. CT imaging of the nasal and paranasal regions has become a gold standart method for the detailed examination of the nasal cavity and paranasal sinuses . In this study we evaluated the angle of septal deviation, ostiomeatal complex diameters, frontoethmoid and sphenoethmoid recess diameters, frontal, ethmoid and maxillary sinus volumes, CB formation as well as the presence of agger nasi, haller, onodi cells and aerated uncinate with CT scan. Since the pneumatization of the whole sinuses continues approximately till the age of 18 in male and 16 in female patients we included patients older than 18 years old in both gender . Nasal septal deviation narrows the middle meatus and exerts pressure to neighboring structures  and therefore compansatuar paraseptal structural changes occur to equalize the passage of the contralateral side of the deviation . Researchers found an association between the prominence of the ethmoid bulla  and CB formation  in the contralateral side of the deviation. Moreover, a reduced ethmoid  and maxillary  sinus volumes and smaller osteomeatal complex  detected in the deviation side. Firat at al have found that total ethmoid cell volume on the ipsilateral side of the deviation was smaller compared with the contralateral side . The authors emphasized that ethmoid cell volume variations compansate the nasal cavity airflow changes due to septal deviation . In a study of Park et al, mean ethmoid sinus volume after 15-16 years of age was 4.51±0.92 cm3 which was similar to our results as 4,5±1,4 cm3 in contralateral side of the deviation . In another study investigating the effect of septal deviation on the maxillary sinus volume, septal deviationwas found to have a significant impact on maxillary sinus volumes . Their findings suggest that maxillary sinus volumes tend to be smaller in the septum deviation side . The mean volume after full growth of the maxillary sinus was 11.1±4.5cm3 to 23.0±6.7 cm3 in previous studies . The mean maxillary sinus volume in our study was 13,8±5,4cm3 in the contralateral side of the deviation which was fairly consistent with literature. The frontal sinuses are the last paranasal sinuses to develop [10,16]. The frontal sinuses are radiologically visible by the age of 6 years.Expansion continues during childhood and reaches its full size approximately at the age of 18 . The volume of the frontal sinus is highly variable, ranging from 0 to 37 cm3. The mean volumeof frontal sinus in the contralateral side of the deviation in our series was 3,9±3,4 cm3. The only study searched for the effect of septum deviaiton on frontal sinus volume was published by Karatas et al, and the authors did not detect an effect of septal deviation on frontal sinus volume . In our study, we found no statistically significant difference between deviated and contralateral sides of maxillar and frontal sinus volumes (p<0,001). In correlation with literature we detected smaller ostiomeatal complex and ethmoid cell volumes (p<0,001) and additionally narrower frontoethmoid recesses (p<0,001). CB is the pneumatization of the concha and is one of the most common variations of the sinonasal anatomy . A 14-53.6% frequency of CB was reported by various studies . We found 67% frequency of CB in our series, the higher incidence of CB in our series may be due to the selected population with the diagnosis of septum deviation. In a study of Uygur et al. The authors mention that septal deviation does not give rise to the formation of CB, but augments the pneumatization of it . Similarly, we found no significant difference in CB formation between the deviated side and contralateral side (p<0,001). CB formation causes a narrow middle meatus likewise septum deviation. We searched for the difference between the nasal structures of middle meatus in CB side and contralateral side. 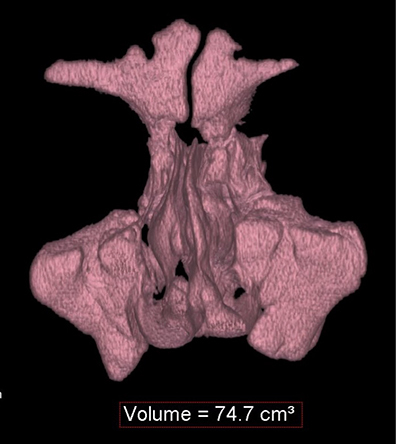 Ethmoid sinus volume was significantly smaller in the CB side (p<0,001). There was no significant change in other parameters between CB side and the other side. Moreover, the presence of concha bullosa in deviated side did not effect frontal sinus volume and frontoethmoid recess diameters. In this study we observed a narrow frontoethmoid recess in deviated side of the nasal septum. Reaching frontal sinus and performing a successful surgery is hard even for experienced surgeons. Unlike the perfect patency of middle meatal antrostomies, surgery of frontal recess area often result in iatrogenic stenosis or obstruction of the frontal outflow tract . This is because of the small dimensions of the space and the limitation of the variability and very complex nature of the cellular patterns seen in this region . The anatomy of the frontal recess is not only variable, but also a hazardous region because of the important neighbouring structures such as, skull base, anterior ethmoid artery, orbit and the olfactory recess. According to our study results, patients with septum deviation have smaller frontoethmoid recess diameters. Therefore, an adequate dissection is hard, and major complications might be encountered when performing surgery to a patient with deviated nasal septum. To the best of our knowledge this is the first study evaluating the frontoethmoid and sphenoethmoid recess diameters in septum deviation and the effects of concha bullosa formation on nasal structures. We hope that this study would give an opinion about the critical anatomic spaces to rhinologic surgeons. This study shows that there is a narrow ostiomeatal complex, frontoethmoid recess area and small ethmoid cell volume in the deviated side of the septum. Awareness of the difficulty in surgical approach of the deviated side will help the rhinologic surgeon in his orientation and preference of the contralateral side will be appropriate while training. 19) Zinreich S, Albayram S, Benson M, OliverioP. (2003) The ostiomeatal complex and functionalendoscopic surgery. In: Som P, ed. Headand Neck Imaging. 4th ed. Mosby, St Louis, pp 149-173.